A highly structured 48 months work plan has been drawn up by the EU-China-Safe to build preparedness to prevent, deter and manage various types of food crises in the food chain, caused by a contamination incident or fraud, which may have a different impact depending on the type of incident (microbiological or chemical incident, fraud, threats or mislabelling). 5 integrated research and innovation work packages (WP) have been designed, and 3 overarching data management, project management and ethics requirements work packages. To connect EU-China-Safe to relevant data repositories where the generated data can be made available after the project end, in particular the H2020 Open Research Data Pilot. The main challenge related to food product traceability is that there is not necessarily a connection between the actual property a food product has (e.g. the actual species used, origin of, or eco-label status of the product) and the claim made in the traceability system which in principle may be true or false (and deciding which is the case is not trivial). A digitised DNA-based traceability system based on blockchain technology will be developed and implemented for pork and for infant formula, establishing a verifiable ‘Chain of Custody’ for product movement through the processing steps in the supply chain. Development of risk-based traceability management and collaboration tools that will support open and transparent information share and collaboration through connected and secure systems across supply chain members in the EU and China, to contribute to the prevention of a major food safety crisis. The specification and development of alerting tools to identify data inconsistencies, thereby enabling supply chain participants to receive real time alerts and be able to take proactive response to such alerts. Method transfer will be achieved through harmonisation activities with (WP3, WP4) and workshops (WP6). WP3 will address the development, knowledge transfer and implementation of innovative research methods and processes for combating food fraud. 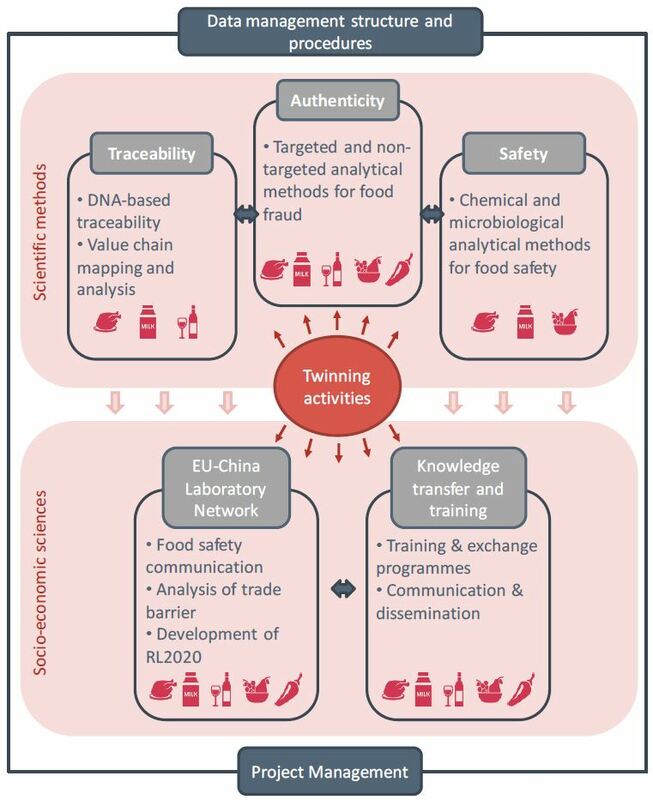 Methodologies for detection of food fraud developed both in the EU and China will be transferred both ways, from the EU to China, and from China to the EU. Methods from previous research and established practices (in the EU and China) will be exchanged and methods implemented. For each food type, a team of EU, Chinese and industry partners has been set up. The methodology will focus on five product groups which are all very susceptible to fraud, i.e. wine, dairy products (infant formula), processed meat, organic fruit and vegetables, and spices. Methodologies are based on the latest technology and include state-of-the-art laboratory-based confirmatory methods. Handheld, portable machine vision based methods for on-site screening will be trialled. In most cases the Standard Operating Procedures of the existing methodology will be exchanged and the methods implemented in the laboratories of the other partners. Exchange of samples and first local surveys will allow the methods to be practiced and performance of the methods compared, whereas a first impression of the prevalence of fraud in those areas will be gathered. Differences in licensing, regulations and food testing methods have huge potential to disrupt international trade. A EU-China research programme focussing on meat, dairy products and, fruits and vegetables will be undertaken to address these issues. The strengths of each method will be assessed and modified if necessary for future technology readiness and application. Method transfer will be achieved following harmonisation activities (WP5) and workshops (WP6). To address current challenges and gaps in microbiological and chemical food safety testing through the implementation of new or improved analytical methods. To transfer analytical methodology and harmonise testing between China and the EU. To improve the safety and quality of food consumed in Chinese and European markets. To improve the food safety infrastructure in both China and the EU. 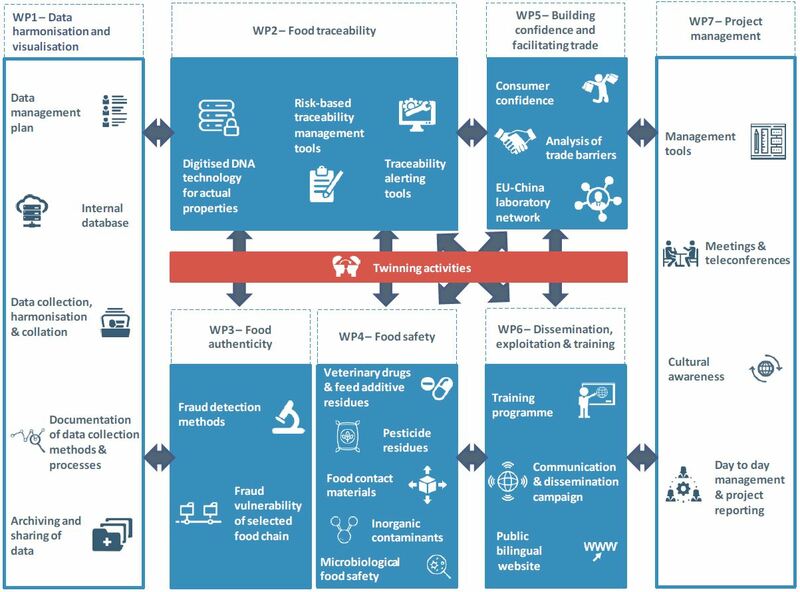 WP5 will integrate natural and social sciences by examining laboratory response, consumer confidence, mitigation of divergent food safety standards through common risk analysis considerations and analysis of economic costs of food incidents. Twinning will take place between corresponding Reference laboratories between EU and China to facilitate knowledge transfer (two ways) of existing best practice. A virtual laboratory (RL2020) will be established to showcase new best practice, ensure harmonisation of laboratory procedures and to build confidence and mutual recognition of results. There will be a strong focus on exchanging best practices between the EU and China and will ensure that there is a full understanding of food safety and authenticity requirements to support compliance of exporting companies with both the EU and Chinese requirements, in support of enhancing bilateral trade of food/agri-food commodities. Emphasis will be placed on reaching consistent laboratory testing regimes as well as food safety standards underpinned by robust risk assessment, with the aim of bolstering consumer confidence in both jurisdictions. Knowledge transfer, together with training, is the key instrument for reinforcing cooperation and increasing the level of collaboration as well as enhancing synergy between the EU and China in food safety area. All training, dissemination and exploitation activities will be channelled through WP6 to ensure effective management and achievement of the project aims. WP6 will deal with communication within the project partners and support the working synergies to be found between on-going EC projects. It will maximise impact delivery in terms of improving safety of food supply and increasing consumer confidence in imported/exported agri-food products. Efficient project management and coordination of the project activities to ensure timely completion of all objectives, milestones and deliverables. Management tools, an extranet portal and consortium meetings will be used to contribute to an operative day-to-day management and project reporting. This work package sets out the 'ethics requirements' that the project must comply with. 5 main food products, namely dairy products (mainly infant formula), processed meat, wine, fruits/vegetables, and spices, which have been at the heart of recent food safety scares, scandals, and trading difficulties both in Europe and in China.